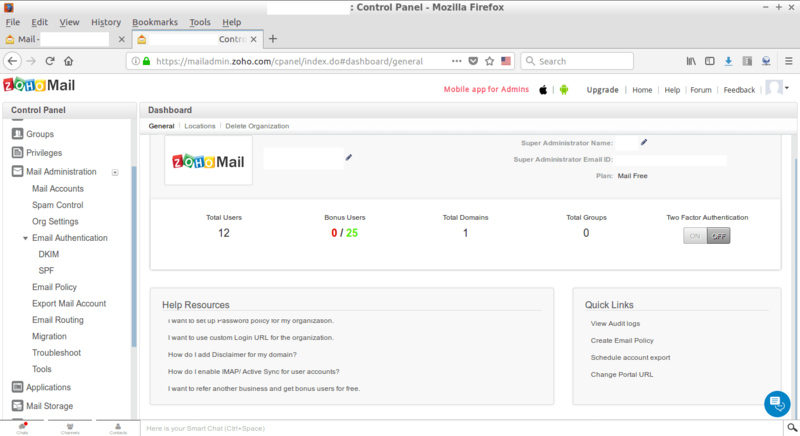 Do you use Zoho to host the email for your website? Well, then you very likely will want to setup the DKIM record in your DNS records to make sure that when you send email, it gets flagged as spam much less. This article will discuss step-by-step how to setup the DKIM record for Zoho on your VPS. 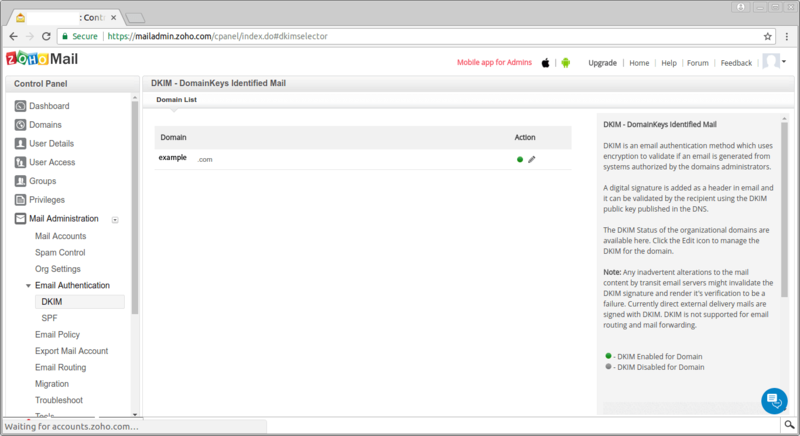 Setting up DKIM is slightly more time consuming than setting up SPF for Zoho mail, but not much more. Next, choose a selector name. Technically, you can use any selector name, but I will assume you are using “example” as your selector name. Next, click on “save”. Zoho will then generate a TXT record for you to use. 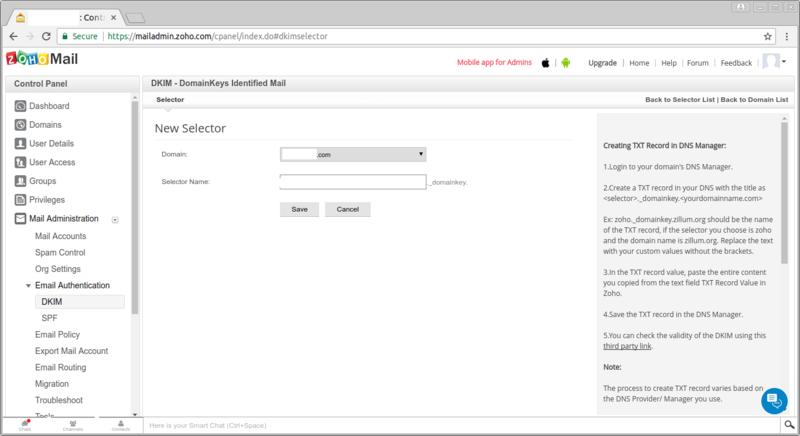 The TXT includes a long public key which makes your email server authenticity very difficult to fake. The p= part means your public key. My public key is 216 characters long, and yours will be similarly as long. Now, copy everything from the TXT record from Zoho, and paste it into a text file for later retrieval. Login however you need to, to get access to your VPS. Remember the record is all 1 line. 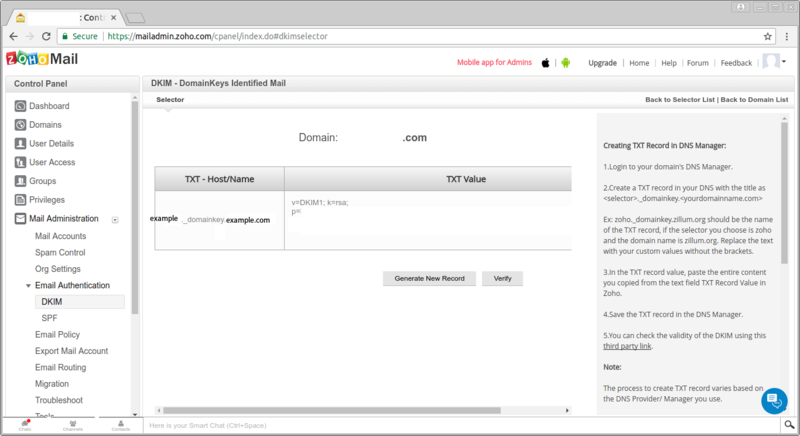 below is an example of a DKIM TXT record. Now save the configuration file after pasting in the appropriate text. Next, we will restart bind for the changes to take effect. Now in the Zoho admin menu, click on the icon that says “verify”. Click on the yellow triangle icon, which is to verify. Once you see a green circle, you know that you setup the DKIM record correctly. Did you like this article? Have anything to add? Let’s discuss it in the comments below.